Jeroen Beckers will guide you through our newest publications of composers like Jules Van Nuffel, Vic Nees, Kurt Bikkembergs, Ludo Claesen and many more. Great music from a small country! Jeroen Beckers (1980) studied at the Hogeschool Zuyd – Conservatory of Maastricht and graduated for ‘Theory of Music’ in 2003 and ‘Violin’ with Sir Dirk Verelst in 2004. Later he continued education at the Lemmeninstitute and the South-Netherlands College for Music and received his Masters and Post Graduate degrees in viola from Sir Marc Tooten. During his study he regularly worked with the Beethoven Academy. He played in the symphony orchestra ‘De Munt’, the orchestra ‘Flemish Opera’ and ‘I Musici Fiamminghi’. Between 2006 and 2009 he was co-leader of the Magogo Chamber Orchestra in Tilburg (NL). As freelance violist he played with the Brussels Philharmonic – VRO, the Brabant’s Orchestra Eindhoven (NL) and the ‘Opéra Royal de Wallonie’ in Luik (B). In 2008 and 2009 was violist with the international chamber orchestra ‘iPalpiti’ from Beverly Hills, Los Angeles (USA). The orchestra performed in Switzerland, Philadelphia (Kimmel Center) and New York (Carnegie Hall). In 2011 Jeroen followed the masterclass choral conducting with Anne-Marie Cabut, director of La Cigale in Lyon (France) and Kari Ala-Pöllänen, former director of Tapiola Choir, (Finland) and in 2014 with Michael Gohl (Switzerland). In 2014 he worked together with John Rutter during the performance of his ‘Mass of the Children’. In 2016 he participated at the ‘International Cantemus Choir Festival’ where he was coached by Denes Szabo and conducted the Cantemus Children’s Choir and Pro Musica Girls’ Choir. He is currently the director of all Cantitare choirs (Children’s Choir, Youth Choir and Mixed Choir) and Bocanto (mixed choir) and conducted ‘La Cigale de Lyon’ for a concert in Sweden. 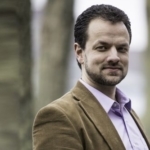 He holds teaching positions at the Academy of Arts in Maaseik (B) as well as the Conservatory of Maastricht (NL) and is vice-president of the ‘Flemish Federation for Young Choirs’ and member of the Music Commission of ‘Koor & Stem’.